Fiore del Liberi is a name that is familiar both to students of medieval military history and practitioners of the skills known as “HEMA” or “historical European martial arts.” In the first decade of the 15th century, Fiore, a knight who was a veteran of several military campaigns and an accomplished duelist and combatives trainer, wrote an illustrated manual called The Flower of Battle, describing his techniques for fighting with a variety of medieval weaponry, from dagger to spear, both in and out of armor. The few surviving copies of this beautifully illustrated manuscript continue to be sources of inspiration and technical knowledge for those, today, who want to understand the martial arts employed by men-at-arms of the Late Middle Ages. 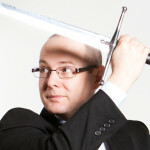 However, you don’t need to leaf through the pages of a centuries-old manuscript with white gloves and a magnifying glass to understand Fiore’s art – in fact, there is a growing roster of scholars and interpreters who study the writings of historical sword-masters like Fiore, and help enthusiasts today (from historical reenactors to sport-fighting competitors) in bringing the medieval fighting arts back to life. Of course, swinging a sword can be great exercise and a fun competitive challenge – but is there more to this practice than merely getting in touch with your inner swashbuckler? Can we achieve a greater appreciation of the ideals of chivalry as we come to understand, not just the skills of medieval sword fighters, but the culture in which they lived (and died), and the context in which they put their formidable skills to use? Guy Windsor is one of today’s most recognized and respected interpretative researchers into Fiore’s arts of battle. 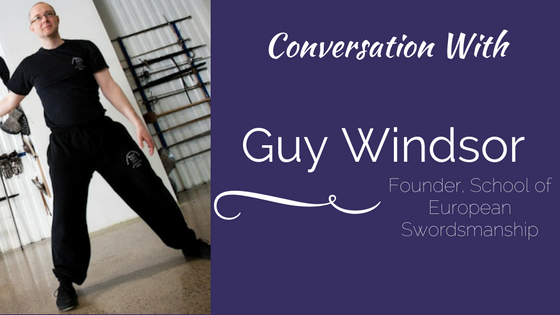 Mr. Windsor studied sport fencing (as well as karate and other Asian martial arts) as a student at Edinburgh University, and in 1994 began participating in the then-very-new and quickly growing field of medieval martial arts. In 2000 Mr. Windsor launched his own foray into teaching historical sword combat, which resulted in the foundation of the School of European Swordsmanship, located in Helsinki, Finland, with affiliated branches all over the world, from Seattle to Singapore. 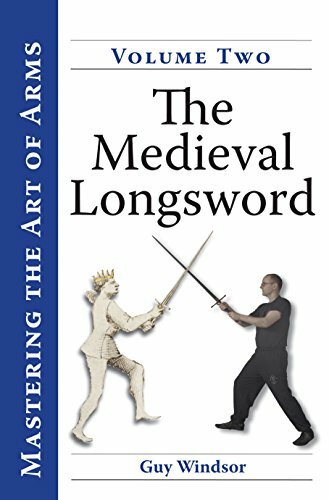 Mr. Windsor is the author of five books on historical dueling and combat techniques, including “The Medieval Longsword,” published in 2014 as the latest volume in his “Mastering the art of arms” series, a “crowd funded” project published through SES.